If you’re like most people, you probably have tons of electronic devices. Flatscreen TVs, home theater systems, cordless phones, computers, printers and digital picture frames are all part our everyday lives. Not to mention the umpteen chargers required for a family's worth of portable devices. What that creates is a giant mess of spaghetti that most people just shove behind a console or table, where it inevitably creates a suitable warren for dust bunnies. Besides looking awful, a tangle of wires is impossible to sort through if you ever need to replace a component in a home theater system, or grab the power cable for your laptop for a trip. Had enough? A simple solution is to sort through all those cords and label each one at the plug and near the device it's connected to. Of course it’s even better to do this when you first get a product, before you hook it up. A label maker is ideal, but if you want to go old-school, masking tape and a sharpie will do. Another tip, group wires and zip tie them together to keep things tidy. Brother P-Touch PT 2430pc Label Maker ($80) Make professional looking labels in seconds with this simple label maker by Brother. The best part, you don’t have to install any extra software. It’s all pre-loaded onto the label maker, so all you do is connect it to your computer with the included USB cord and off you go. It prints labels up to one inch wide, has an automatic cutter and takes six AAA batteries. 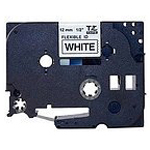 Brother TZFX231 White Flexible ID Tape ($20, 26.2-foot roll) This specialty tape is perfect for wire labeling because it’s laminated, bends easily and sticks to itself for easy labeling of cords. 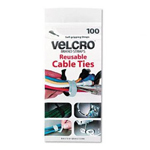 Velcro Reusable Self-Gripping Cable Ties ($10, 100 ties) These reusable Velcro ties from Velcro make organizing your wires a cinch. The tie easily opens and closes, and attaches to one of the cords in the bunch so you won’t lose it. Labeling wires is a great idea for later when things have to change. After labeling, get your cords out of the way with Cord Cradles. Cord Cradles can hold from 1 cord up to a whole bundle, and they keep those cords where you put them. Cord Cradles can be quickly installed without tools and without moving furniture. Cords can easily be added or removed without replacing parts. Cord Cradles make it easy to clean up and organize your cord messes.